My gosh, the back-and-forth over who’s going to be back for Star Wars: Episode VII. Earlier this week, Carrie Fisher told the Del Boca Vista Newsletter or wherever “yes” when asked whether she was going to be back for Episode VII. But yesterday, her representatives were sweeping the web, making sure everybody knew that Fisher was TOTALLY KIDDING and nothing was in stone yet. of course they’re all coming back. I‘s might not yet be dotted, nor T‘s crossed, nor (and this is what I would bet is the actual point of swatting down rumors) official press events scheduled, but obviously they’re all in. These movies are going to be the last significant paydays of Mark Hamill’s and Carrie Fisher’s careers, at least until Kate Hudson and Goldie Hawn remake Postcards From the Edge, and while Harrison Ford is arguably flush enough (and grumpy enough) to say no, he won’t. How significant the roles of Luke, Leia, and Han will be in the new trilogy IS a question, but the fact of Hamill, Fisher, and Ford’s participation isn’t worth all the sweat these publicists are putting into it. Bottom line: George Lucas just said so. 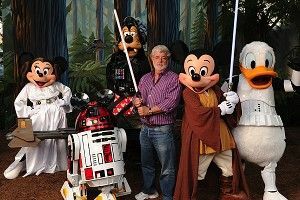 And if there’s anything that a Star Wars fan should put his faith in at this point, it’s the thoughts and ideas of George Lucas.